When does standing by require standing up? 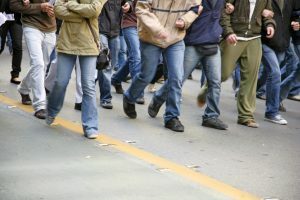 Montgomery County, Maryland is considering a revamped proposal to allow public high school students to take as many as three excused absences a year to participate in political protests and other forms of “civic engagement” during the school day. This would allow students to take part in marches, protests, lobbying, and other acts of political action. When it was introduced in September, the proposal required parental consent, the approval of the school principal and permission from the organization sponsoring the political activity or protest. Excused absences would not be approved for spontaneous walkouts or protests. Students who leave campus without receiving approval would not receive an excused absence. The final version of the proposal is still being drafted. Public reaction to the proposal has been mixed. Critics agree that students should have an opportunity to express their concerns, lest students feel their voices do not matter. But they express concern that students would be missing out on valuable school time and disrupting the school day. “You are sending a message to the MCPS community that student protesting is more important than them being at school engaged in learning,” one commentator wrote. Do you favor or oppose the proposal discussed in the above news article? What are your reasons? How would you respond to people whose opinions about the proposal differ from your own? How would such a proposal be regarded in your school district? One way to understand and interpret the figure of John the Baptist in the New Testament gospel narratives is to regard him and the movement he generated as a protest against the status quo. John’s fiery preaching arose from a holy impatience with human complacency toward the evils of injustice and oppression. He called for repentance, which meant a change of direction in the ways of human behavior and society. Many of the people who gathered around him were eager to change their own lives in accordance with his preaching and they asked him for instruction on how to do that. They had, apparently, grown tired of their own complacency and become ready to make changes for the better, changes that would alter the status quo. We can picture the kind of protests discussed in the preceding news article as similar in sight and sound and character to the gatherings occasioned by John the Baptist. Both contexts involve impatience with the status quo and calls for change. Students who might receive an excused absence from class in order to participate in a protest are eager to stand up for the better world they long to see rather than stand by in complacency toward the way things are. The phrase “standing by” can mean two very different things. In one sense, “standing by” can mean remaining detached and indifferent, uninvolved, uninterested and unengaged. In that sense, “standing by” can mean accommodating the status quo. But “standing by” can also mean remaining alert and watchful, expectant and ready. In that sense, “standing by” can mean remaining prepared to take action against the status quo. In Christian faith and practice, the liturgical season of Advent focuses on “standing by” in the second sense of that phrase. Christians understand themselves to be on “stand by” for the coming of Jesus Christ. The world’s form and future belong to Jesus rather than to any other person, power, or authority. The fulfillment of all longing for a better world is assured by the life, death, resurrection and promise of Jesus, and this is the good news that Christians celebrate and confess. Christians live on “stand by” for the culmination and completion of that good news and Advent is the season in which the church annually re-trains its “stand by” muscles. But Christian “standing by” for the coming of Jesus (which is to say, for the culmination and completion of his good news, his gospel) does not mean remaining detached and indifferent, uninvolved, uninterested and unengaged. In fact, the Advent call to repentance is itself a protest against the status quo and all habits of complacency. To stand by for the coming of Jesus means to stand up for the better world that his coming inaugurates. Christians are called to protest the status quo and to resist the habits of complacency because the coming of Jesus brings the extinction of the status quo and raises new life from the tombs of complacency. Has there ever been a situation in your life that stirred you to stand up against the status quo? If so, share that story and describe what you did, why you did it, and what happened in consequence. Have you ever felt yourself stirred to stand up for something but did not do so? If so, share that story and describe what held you back and what you learned from that experience. How does your faith in Jesus influence your decisions about whether to stand by or to stand up? What instruction do you imagine John the Baptist might offer you regarding your own repentance? Think of a person you know and admire as an example of someone standing up against the status quo. Share what you know about that person and their actions, and describe how their example has influenced your life.